At the juvenile courthouse: 2L Roodelyne Davilmar, who argued the case, Marcela Alvarez and a relative, five year old Yoselin and 2L Brasilia Echevarria. In its efforts to continue to reach underserved populations, Miami Law’s Health Rights Clinic has developed a medical-legal partnership with the University of Miami Miller School of Medicine to provide legal services at the Pediatric Mobile Clinic. The Clinic’s presence has allowed immigrants who are seeking medical assistance to also have an opportunity to speak with law students about possible legal issues. The clinic has encountered cases involving special education placements, public benefits, and children who qualify for special immigrant juvenile status. 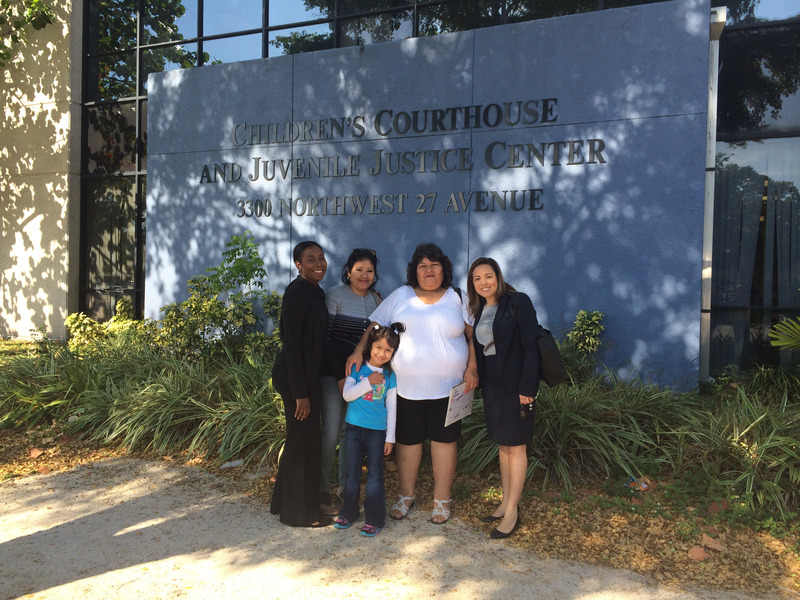 In the first case taken on by the Clinic, third-year law students Diana Jordan and Bethany Bandstra successfully petitioned the Juvenile Division 11th Circuit Court of Florida on behalf of a 16-year-old girl who fled her native Honduras due to abandonment and abuse by her family. The Clinic is now working on terminating the deportation case against her once she has been granted Special Immigrant Juvenile Status, as well as preparing her legal permanent residency application. In another case, second-year law student Roodelyne Davilmar is providing assistance to 5-year-old Yoselin Pavon. When she was nine months old, Pavon’s mother gave her to a criminal smuggling gang to transport the baby over the U.S. border from Mexico. When Pavon’s mother attempted to cross the border, U.S. Custom and Border Patrol agents detained her. The smuggling gang held the baby for ransom, and after fifteen days Pavon’s grandmother, who was living in Florida, paid the ransom and was reunited with her granddaughter. The grandmother attempted to enroll her granddaughter, now five years old, in public school, but the child was denied because of her immigration status. Through its efforts, the Health Rights Clinic has successfully advocated to enroll the youngster in school and Davilmar won the petition before the Juvenile Division 11th Circuit Court for dependency on Monday. The Health Clinic has also taken on the cases of two brothers from Honduras - A.M., age 16 and A.M., age 14 - who are currently in removal proceedings. When they were very young, the brothers lived with their mother and her abusive boyfriend. The brothers were subjected to both physical and mental abuse while their mother failed to provide them even with the most basic of necessities. Their grandfather took the brothers away after years of abuse and they lived with several different family members. The brothers eventually ended up with an aunt, whose husband was the leader of a drug trafficking organization. The boys were forced to work as drug mules, often retrieving packages dropped by airplanes. When the boys refused to work, their uncle would become violent. Left with nowhere else for his sons to go, the boys’ father, who was living in the United States, arranged for the boys to cross the border in July of 2014. They were picked up by Customs and Border Patrol and held for six days before being released to their father, but were placed in deportation proceedings.